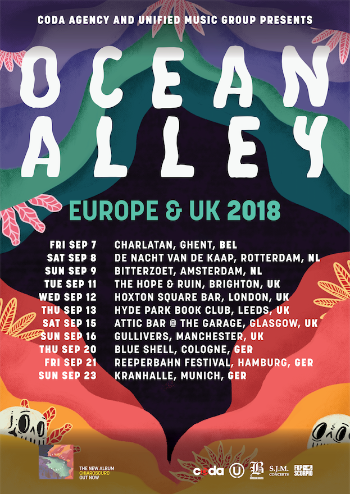 Australian psych-surf-rockers Ocean Alley have announced three UK headline dates in August, with shows in London, Glasgow and Manchester. Tickets will go on sale at 9am on Friday (8th March) and will be available here. The band are currently touring Australia supporting Tash Sultana, before a slot at Byron Bay Bluesfest in April and an extensive run of dates in the US and Canada during May, June and July after which they head to the UK for their run of headline shows and slots at Reading & Leeds and Boardmasters festivals. With two albums under their belt, Lost Tropics (2016) and last year’s critically acclaimedChiaroscuro (2018) – which spawned the triple j Hottest 100 #1 ‘Confidence’ – the band have captivated audiences worldwide with their infectious blend of psychedelic surf-rock, selling out a slew of shows at home and abroad, plus performing at festivals including Splendour In The Grass (AU), California Roots (USA) and Rhythm and Vines (NZ). 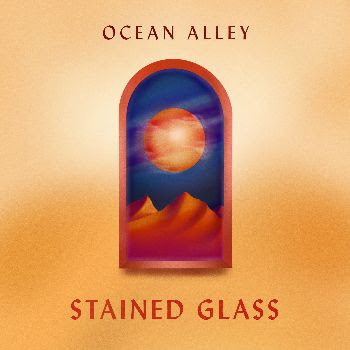 Fresh off-the-back of last month’s Hottest 100 onslaught, Sydney’s Ocean Alley have today released the sun-bleached new single and tranquil video ‘Stained Glass’. Premiered on triple j Drive yesterday, ‘Stained Glass’ is the first taste of new music since the band dropped their momentous second albumChiaroscuro last March. Watch ‘Stained Glass’ via YouTube. Stream and download the track here. Moody and expansive in sound, ‘Stained Glass’ creeps up on the listener; fusing elements of blues and surf-rock with Baden Donegal’s soulful voice, lingering heavily over dreamy tones and swirling organs. As the harmonies and dense reverb simmer, the track launches into its grand zenith, a multi-layered tapestry of emphatic, driving guitars paired with big crash cymbals and a hypnotic melody line. Ocean Alley are supporting the Don’t Kill Live Music campaign with a short performance at today’s rally in Hyde Park, before kicking off a 12-date national tour supporting Tash Sultana tomorrow. The band will then cross the ditch for six shows in New Zealand through April, returning home to play at Byron Bay Bluesfest and then headed back to the United States and Canada for an extensive run of dates during the Northern Hemisphere summer. Hailing from Sydney’s Northern Beaches, six-piece Ocean Alley – Baden Donegal (vocals), Angus Goodwin (guitar), Nic Blom (bass), Lach Galbraith (keys/vocals), Mitch Galbraith (guitar) and Tom O’Brien (drums) – solidified their position as one of Australia’s most exciting bands in 2018, having surpassed 60 million catalogue streams and achieving the impressive feat of attaining more than1.4 million monthly Spotify listeners. With two albums under their belt, Lost Tropics (2016) and the critically acclaimed Chiaroscuro (2018) which peaked at #11 on the ARIA Chart and spawned the triple j Hottest 100 #1 and ARIA Top 10 Platinum-certified single ‘Confidence’, the band have captivated audiences worldwide with their infectious blend of psychedelic surf-rock, selling out a slew of shows at home and abroad, plus performing festivals including Splendour In The Grass, California Roots (USA) and Rhythm and Vines (NZ). Available to stream and purchase here. 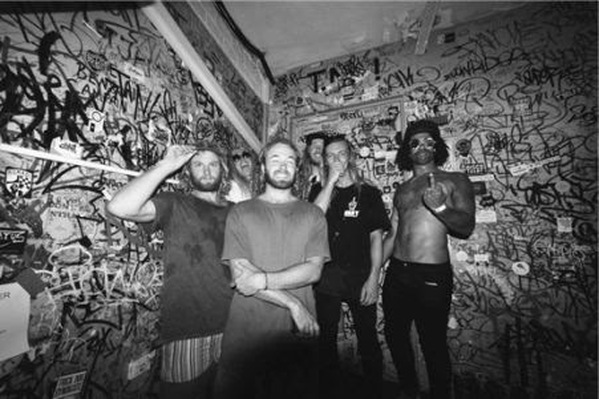 Northern Beaches funk lords Ocean Alley have taken out the #1 spot in triple j’s Hottest 100 of 2018 with their groove-fuelled hit single ‘Confidence’, also placing #100, #16 and #10 for their standout tracks ‘Happy Sad‘, Like a Version cover of ‘Baby Come Back‘ and ‘Knees’ in the world’s largest music poll. An undeniable fan favourite, ‘Confidence’ was certified gold in November, having moved over 35,000 units in 2018 and now surpassing 13 million streams since it was released last February. Three tracks are taken from the band’s critically acclaimed second album Chiaroscuro, which debuted at #15 on the ARIA Album Chart and has gone on to clock up more than 35 million streams in its first 10 months – it’s future classic status affirmed being voted #2 Album of the Year in triple j’s end of year listener poll. 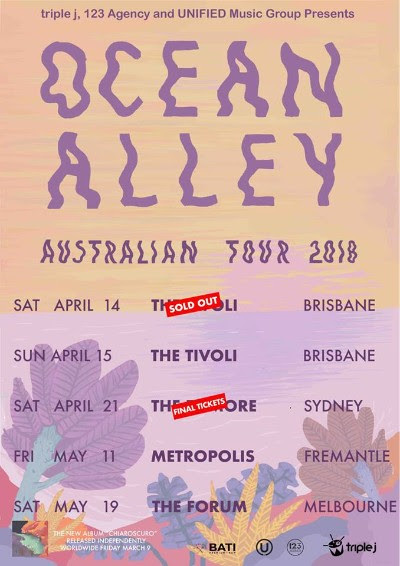 2018 saw Ocean Alley solidify their position as one of Australia’s most exciting bands, making their mark on the local and international touring circuit playing 96 shows across 10 countries and 60 cities, including selling 25,000 tickets across 15 sold out Australian shows. They were the 5th most played artist on triple j last year and have achieved the impressive feat of attaining over 900,000 monthly listeners on Spotify. Ocean Alley are back on the road next month, touring nationally with Tash Sultana through February and March before stopping into New Zealand for six shows in April. They’ll return home for a performance at Byron Bay Bluesfest and then head back to the United States and Canada during the Australian winter months for an extensive run of dates. 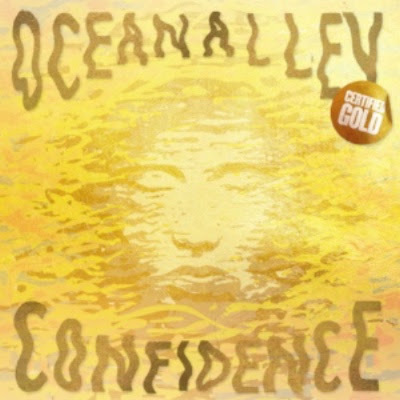 Northern Beaches masters of groove Ocean Alley are stoked to announce their funky hit-single ‘Confidence‘ has been certified gold in Australia. A huge crowd favourite in the band’s live show, ‘Confidence’ has moved over 35,000 units since its release in February this year, surpassing 8 million streams and over 1.5 million video plays. The track comes from their critically acclaimed second album Chiaroscuro which was recorded and produced by long-time friend Callum Howell at The Grove Studios, and released independently with distribution via UNIFIED Music Group. The record has clocked up a number of impressive feats, selling over 10,000 copies and amassing over 20 million streams, debuting at #15 on the ARIA Album Chart and nominated for J Award ‘Australian Album of the Year’. 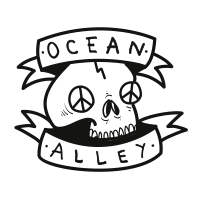 2018 has seen Ocean Alley continue to carve their place in the international music scene with their relentless touring schedule – the band playing 96 shows around the world, visiting 10 countries to perform in 60 different cities. They recently stopped into Chicago Music Exchange, home to one of the world’s premier collections of vintage guitars and basses, to contribute a cruisey live rendition of ‘Knees‘ to CME’s Labor of Love sessions. Back on home soil, Ocean Alley sold over 25,000 tickets to their Australian shows including 15 sold out dates – the six-piece using their growing profile for good, partnering up with the Cerebral Palsy Allianceto raise $17,000 from their ticket sales to increase awareness of the disability and encourage public support. To make a donation, or to find out more information on Cerebral Palsy Alliance visit here. 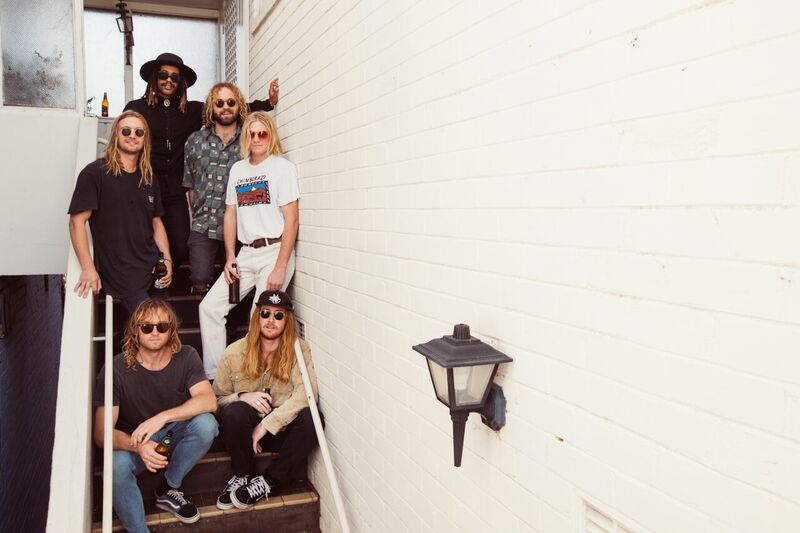 Rounding out their biggest year yet, Ocean Alley are currently playing their final North American shows with Tash Sultana, before returning home bring in the new year at Falls Festival. They’ll rejoin Tash in 2019 on support duties during her Australian tour throughout February and March. Northern Beaches psych-rockers Ocean Alley are thrilled to be teaming up with Cerebral Palsy Alliance (CPA) later this month, raising money for the initiative through ticket sales from both sold-out Sydney shows as well as setting up a platform for friends and fans to donate online. 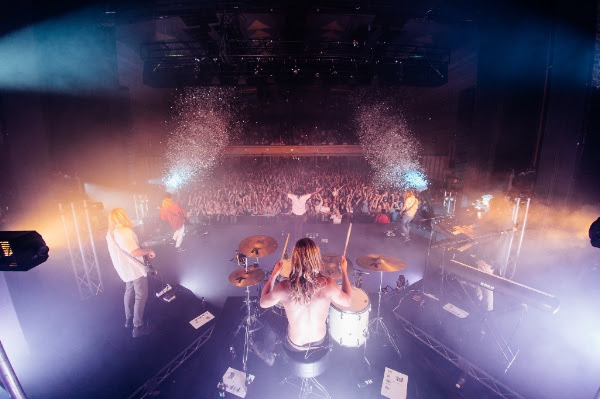 The news comes with the announcement of local supports for all dates of their upcoming regional run, which has sold out six of eight dates and recently expanded with a performance in Byron Bay. To make a donation, or to find out more information on Cerebral Palsy Alliance visit here. Cerebral palsy is caused by injury to the developing brain, and is the most common physical disability in childhood. In Australia, one in every 500 babies is diagnosed with cerebral palsy, a lifelong disability that affects movement and muscle control. Ocean Alley will donate $2 per ticket from both Sydney shows, with good mates Coopers Brewery, UNIFIED Music Group, 123 Agency and Wrangler Australiathrowing their support behind the initiative – collectively raising over $20,000 for CPA. The band has a longstanding association with Cerebral Palsy Alliance’s Twenty/20 Challenge event, which raises funds for essential equipment for children, and hopes that with the increased awareness over these two shows, public support will take their contribution to even greater heights. Local supports for Ocean Alley’s upcoming regional tour feature a diverse array of Australia’s hottest up-and-coming artists. Pop/alt-rock quartet The Moving Stills will warm up the crowd for both Terrigal shows, while wizards of tropical-funk and psychedelia Young Monks open in Canberra. Garage rockers Crocodylus and groovy blues quartet Eagle Eye Jones are taking over the stage for two nights in Sydney, followed by indie-rock duo CLEWS and the melancholic sounds of alt-indie artist Jaguar Jonze both gracing back-to-back nights in Byron Bay and Gold Coast. Paradise Club close out the stellar bill in Adelaide, performing their dreamy indie rock for Ocean Alley’s last local headline show for 2018. Having fast become a fan-favourite on the band’s sold out Australian tour, conjuring mass crowd sing-alongs on all stops, the band’s most recent single ‘Knees’ combines dreamy tones with hopeful yet commanding vocals and stunning harmonisation. The video portrays an endless summer, the lo-fi, grainy vision evoking a sense of nostalgia as Australia moves into the sombre, cooler months. Tying in with the album’s theme of dark and light, the heavy weight of the song’s lyrics and emotive sense of longing is juxtaposed with the warm, floating imagery. 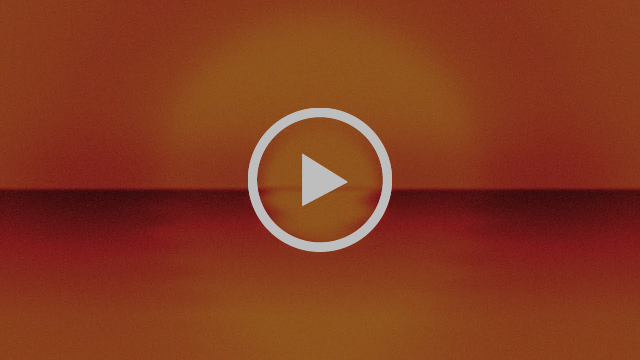 Ocean Alley are thrilled to unveil the sun-kissed new video to accompany the raw and wistful ‘Knees’, a standout cut from their acclaimed second album Chiaroscuro – of which the 2nd vinyl pressing is now available. The band are taking the LP on the road in North America for 29-shows through May and June, having kicked off in San Diego this week and with two dates already sold out in Canada. Watch the video for Knees here. Chiaroscuro vinyl is available from 24Hundred, JB Hi-Fi and local retailers. Having fast become a fan-favourite on the band’s sold out Australian tour, conjuring mass crowd sing-alongs on all stops, ‘Knees’ combines dreamy tones with hopeful yet commanding vocals and stunning harmonization. The video portrays an endless summer, the lo-fi, grainy vision evoking a sense of nostalgia as Australia moves into the somber, cooler months. Tying in with the album’s theme of dark and light, the heavy weight of the song’s lyrics and emotive sense of longing is juxtaposed with the warm, floating imagery. Off the back of their sold out 7-date Australian tour, Ocean Alley have received widespread praise for their mesmerising live performances, X-Press claiming “their live set was seamless, echoing their recorded music and enhanced by their sensual stage presence”, Savage Thrills declaring “they can’t seem to set a foot wrong” and The Music suggesting “…would be wise to follow these boys into the wild and windy surf”. Masters of groove Ocean Alley have sold out their entire national tour, adding their upcoming shows in Fremantle and Melbourne to the extended list and bringing their final tally to nine sold out dates around the country. The band is currently on tour with Groovin’ The Moo, and are set to make their triple j ‘Like A Version’ debut this Friday morning. Having already played two sold out nights in each Brisbane and their hometown Sydney, Ocean Alley’sdynamic performances have been complimented by the likes of Bridget Hustwaite (triple j) as “So electric”, Reverb Online for having “the crowd singing every word and totally mesmerised” and Rabbit Radio as “one of the most incredibly powerful live moments I’ve ever witnessed.” Following this run of dates, the six-piece will make their North American debut with a 30-show tour across the USA and Canada, before returning home for their first appearance at Splendour In The Grass. Hailing from Sydney’s Northern Beaches, Ocean Alley – Baden Donegal (vocals), Angus Goodwin (guitar), Nic Blom (bass), Lach Galbraith (keys/vocals), Mitch Galbraith (guitar) and Tom O’Brien (drums) – have captivated audiences around the country with their infectious melody lines and memorable blend of psychedelic-surf-rock, amassing over 28 million streams online and more than525,000 monthly Spotify listeners. With two acclaimed albums Lost Tropics (2016) and Chiaroscuro(2018) under their belt and Australia voting their beloved single ‘The Comedown’ into triple j’s Hottest 100 of 2017 at #48, the band have sold out headline shows nationally, in New Zealand, Germany, Netherlands and The UK, shared the stage with artists including Tash Sultana, The Cat Empire, and Xavier Rudd, plus performed at festivals locally and abroad including Falls Festival, Rhythm & Alps (NZ), Groovin’ The Moo and more. OCEAN ALLEY announce supports on upcoming national tour; Second Melbourne show on sale now! Sydney’s groovy, psych-rock six-piece Ocean Alley are thrilled to announce supports on their upcoming Australian tour, which recently expanded with a second and final show at The Forum in Melbourne on May 18. Kicking off later this month, the tour will feature New Zealand’s Tunes Of I nationally, plus a slew of stellar local acts added across each city. Final tickets to remaining shows are on sale now via oceanalley.com.au. Joining the lineup as national tour supports are Wellington sextet Tunes Of I, one of New Zealand’s most exciting up and coming roots acts, with a genre-defying sound that blends dub, rock, reggae, funk, soul and psychedelia. Funky, coastal chill-hop outfit Drop Legs and the warm sounds of psychedelic pop-rockers Sunrose will take over the stage for a night each in Brisbane, with spaced-out garage rockersThe Jim Mitchells opening the first Sydney performance and both shows in Melbourne. Groovy blues quartet Eagle Eye Jones will perform at the second Sydney show, and rounding out the bill in Fremantle are funk-infused indie-rockers Great Gable and indie-pop singer-songwriter Elli Schoen. Hailing from Sydney’s Northern Beaches, six-piece Ocean Alley – Baden Donegal (vocals), Angus Goodwin (guitar), Nic Blom (bass), Lach Galbraith (keys/vocals), Mitch Galbraith (guitar) and Tom O’Brien (drums) – have captivated audiences around the country with their infectious melody lines and memorable blend of psychedelic-surf-rock, amassing 20+ million streams online and over 535,000+ monthly Spotify listeners. Their second LP Chiaroscuro, “12 tracks dripping in salty psychedelic surf-rock gold” (Pilerats) has received widespread acclaim, and with a stellar ARIA debut at #15 it’s clear“Ocean Alley’s biggest days are still ahead of them” (Life Without Andy). 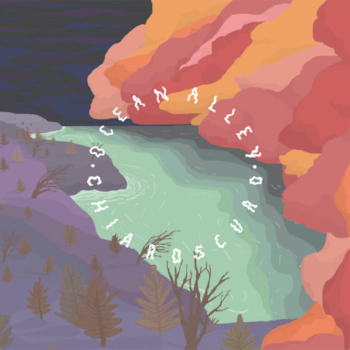 Chiaroscuro is available to purchase digitally and on vinyl here. Tickets are on sale now viaoceanalley.com.au. Hailing from Sydney’s Northern Beaches, six-piece Ocean Alley – Baden Donegal (vocals), Angus Goodwin (guitar), Nic Blom (bass), Lach Galbraith (keys/vocals), Mitch Galbraith (guitar) and Tom O’Brien (drums) – have captivated audiences around the country with their infectious melody lines and memorable blend of psychedelic-surf-rock, to solidify their position as one of Australia’s most exciting rising bands. With their acclaimed debut album Lost Tropics (2016) and two EPs under their belt, the band have amassed over 20 million streams online, sold out headline shows across Australia, New Zealand, Germany, Netherlands and The UK, shared the stage with artists including Tash Sultana, The Cat Empire, and Xavier Rudd, plus performed at festivals locally and abroad including Falls Festival, Rhythm & Alps (NZ), Groovin The Moo and more. Ocean Alley have celebrated the release of new single “The Comedown” with a run of sold out shows across Australia & New Zealand. Added to high rotation on Triple J, “The Comedown” is a maturing and sobering insight into the band’s musical direction moving forward. Following on from their 2016 full length debut Lost Tropics, Ocean Alley have worked hard on the road over the last 12 months and beyond, taking their eclectic brand of psychedelic rock across the world, with sold out shows in the UK, Netherlands, Germany and New Zealand, along with their home country of Australia.